Al Ewing writing the Hulk again. Say no more, fam. Does anyone that’s read Immortal Hulk actually need me to explain in a snappy little paragraph why I was excited to read this one? Immortal Hulk: The Best Defense #1 starts with a trope that’s a little weak and hard to take seriously: Doctor Strange is dead. Yeah, right. It’s only a little strange weird because we know Marvel isn’t going to kill him off panel in this very first issue, but still, the discovery of his bones is an at least intriguing set up for the rest of the issue. 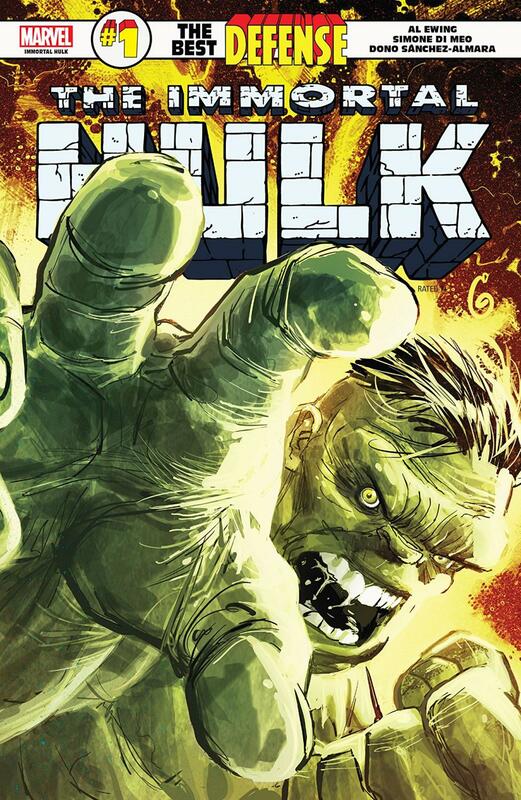 It gets us everything that we love about Ewing’s Immortal Hulk – the mystery, the symmetry, the call backs to Hulk’s early days, the violence (although it’s not as gruesome compared to his main book). Both Banner and Hulk are of course terrifying yet sympathetic and likeable. It makes it very easy for me to recommend to fans of IH who might not be as interested in the rest of the Defenders. You could probably get away with just picking up this issue and the main Defenders finale. The interlude does break the pace pretty harshly. I might not feel that way if it were a little more substantial, but it’s so short and we just don’t really learn anything from it. As it was, I could have done without it, but I’m willing to bet it won’t feel intrusive in a trade. Di Meo puts forth tremendous effort to sell the setting as desolate and empty, upping the air of dread and tension throughout the story. His Banner is appropriately creepy and on edge, pulled off by a wide range of faces that aren’t held back. His line work brings a lot of grit to the fights. It puts you in the shoes of the innocent bystander, holding their breath and begging for the brawl to stop. The colors in a story like this could and so often would be monotonous and drab, but Sanchez-Almara brings a surprising amount of variety. There are some scenes where there doesn’t seem to be a lot going on, but the lighting is given the attention it deserves to drive the tension up the wall. It’s all about the mood, but the palette itself isn’t neglected in its service. Immortal Hulk: The Best Defense #1 is, to no one’s surprise, another awesome contribution from Ewing. His Hulk is great on his worst day. This issue does have a couple of weak areas, but they don’t detract from the book very much. Di Meo and Sanchez-Almara are a great team, putting together pages that feel somber and full of strife. Like I said, fans of Ewing’s Immortal Hulk should absolutely pick this up.